ºThe victim and the scammer are sitting in the scammer's living room when a friend/partner of the scammer who the victim does not know comes into the house, excitedly shouting, "I got the marking solution and the contact lenses!" Of course the friend pretends not to know that the victim is there. The victim, a seasoned poker player, is immediately more than curious. He asks the scammer, "What is going on with marking solution and contact lenses? What are you guys up to? He knows it's got something to do with a poker card-marking cheat operation. The scammer "hesitates" to tell the victim but then lets him in on it. He first allows the victim to insert the contact lenses in his own eyes while he (the scammer) marks the backs of the cards lying on the coffee table with the solution. As the victim sees the markings on the cards through the contact lenses, he is naturally astonished. The scammer then explains the card-marking scam he is going to do with the friend, offering the victim the chance to participate. He tells the victim that they are going to scam a big no-limit hold'em game in Vegas's biggest-action poker room. He and the friend need the victim to join in the scam as a player to bump pots and make key bets to allow the scammer and the friend to raise pots as well. The victim is told that he does not participate in wearing the contact lenses and marking the cards. The scammer showed him the markings only to establish the credibility of the card-marking scam at the poker table. The victim is rearing to go because he does not have to be involved in the risky part of marking the cards and will have no evidence (marking solution and contact lenses) on his person as the scam goes down. He thus thinks he is involved in the scam to cheat all the other players in the big no-limit hold'em game. They choose a $30-60 no-limit game. Since the scammer and the friend cannot really see the cards, they must signal the values of their own hole cards so that they know what each other has in the hole. But how do they know what the victim has? Simple: they get the victim to tell them without making it complicated. The victim is told to signal only if he has a pair of tens or higher in the hole. He does this by a simple gesture on his cards. He is further told to bet this hand in first position or raise if someone has bet before him. If he turns a set he follows the same bet-or raise instructions. This assures the scammer and his friend of knowing when the victim has a strong hand, strong enough where he can go all-in and reveal his hand at showdown without breeding suspicion. Now the victim is completely set-up by the scammer and his friend. Since the victim believes he is partners with the scammer and the friend to cheat the rest of the poker table, he does not worry about losing his chips to either of the two. 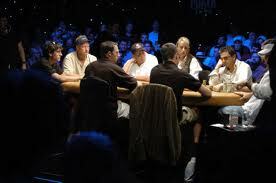 Before the trio hits the poker table, the victim is told that if he loses his chips in the game to the player or his friend, he will be replenished with cash when either the victim or his friend meets him away from the poker table, in a meeting place completely outside the casino. Before the big reverse scam move goes down, the victim has been raising and re-raising pots according to the instructions he had received from the scammer and his friend. He had been told that his function is to help bump-up pots when the scammer and his friend know they have the winning hand. This goes on for a varied amout of time until the ideal situation develops to take the victim down. That situation is when the victim has the high pair in the hole and flops a set while the scammer and friend enter the turn with straight or flush possibilities. When either the scammer or friend or both connect, the victim is signalled to move all-in. He is called by either the scammer or friend or both, and thus loses all his chips, usually an amount of $20,000 or more. The only thing that can stall the big scam is when the board pairs up and the victim makes a full house or four of a kind. When that happens, the victim moves all-in but is not called by either the scammer or the friend. So now what? The scammer and the friend have all the victim's chips. Let's say that the scammer won the all-in hand against the victim. Now it is necessary for the scammer and friend to end the contact with the victim. A few moments after the big-scam hand, two men dressed in suits approach the poker table and one of them bends over the scammer and says in a low voice but loud enough for the victim to hear, "Would you please come with us, sir?" As the scammer gathers all his chips and leaves with the two men, the victim, naturally assuming that the two men in suits are detectives or FBI, panics and makes nervous eye-contact with the friend. The friend signals the victim to leave the table and go back to the scammer's apartment immediately. When the friend and the victim are sitting in the apartment, nervously speaking about what could have happened, the phone rings. The friend tells the victim to answer it. The victim does, and of couse it is the scammer on the line, who tells the victim that he is in FBI custody and is being charged with numerous felony counts pertaining to cheating in gambling casinos. He tells the victim that he and the friend had both better get the hell out of town quickly, that the FBI is going to track them down. The victim and the friend part ways in a hurry. The victim probably never comes back to Vegas, or at least not for years, and the scammer and his friend enjoy the victim's money, knowing that the victim probably will never know he had been scammed. This is one of the greatest reverse poker scams ever done. To read the greatest reverse casino scam ever done, click here.